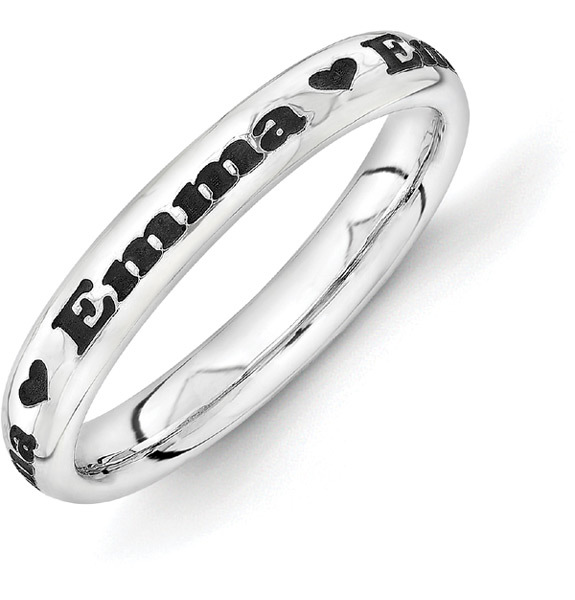 Personalized, black antiqued name ring with heart symbol custom made for you in .925 sterling silver. The name is repeated all the way around the band with the heart symbol in between. The band measures 3mm wide and is available in full sizes 5 - 9. Great as stackable bands or worn by itself. You can stack two or three together and create a multiple set. You can also engrave the inside of the band with up to 20 characters (including spaces), in block or script font. Also available with cross symbol or plain, shown below. We guarantee our Personalized Black Antiqued Name Ring with Heart in Silver to be high quality, authentic jewelry, as described above.